For the ice cream loving couple... 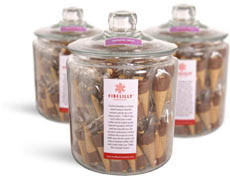 I thought these FireLilly Gourmet Truffle Cones would be a pretty adorable favor or addition to the out-of-towner bag or candy bar. They come in six flavors, including my personal favorite, peanut butter. They are individually wrapped and come in a convenient Costco-worthy container. i would love to get these as a favor, yum!!! Great idea for the candy bar, they look so yummy!